Attaining celebrity status is something that most people only achieve after putting in many years of hard work in their careers. But for someone like Christiana Barkley, she hadn’t even kickstarted her career before news got out about who she is. This is mostly how the story starts for people whose parents are themselves celebrities. However, despite being born into fame and fortune, Christiana is not relenting in making a name for herself but every now and then, she is mostly made mention of for who her parents are. Be that as it may, here we will present to you all that we know about her including where she trained for her journalism career. Christiana Barkley was born to Charles Barkley (father) and Maureen Blumhardt in the very year they got married (1989). She is the only known child of her parents. Her father, nicknamed Chuck, the Round Mound of Rebound and Sir Charles is a legendary National Basketball player who rose to fame as one of the dominant Power Forwards in the NBA. He now works as an analyst on Inside The NBA. His wife Maureen on the other hand, is a former model who is now dedicated to serving humanity with her philanthropic acts, social work and advocating for women rights. She is a member of the Fresh Start Women’s Foundation which advocates for the welfare of women and provides them education, support, and resources for a meaningful life. 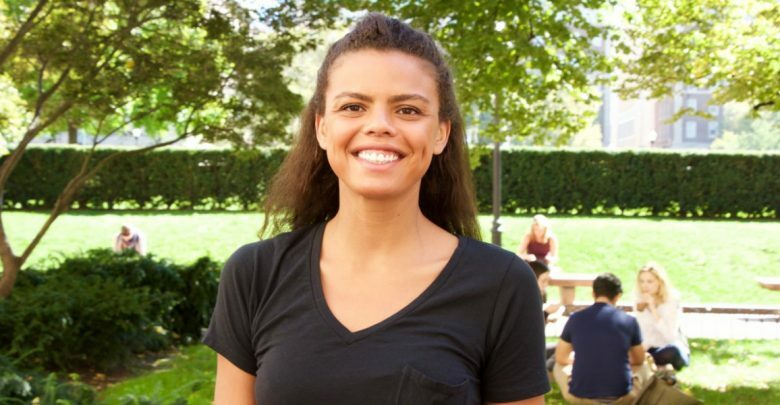 For her education, there are reports that Christiana Barkley attended high school in her home town and afterward enrolled at Villanova University situated in Radnor Township, Pennsylvania, United States. At the end of her studies at the oldest Catholic university in the Commonwealth of Pennsylvania, Christiana proceeded to study journalism at Columbia University Graduate School of Journalism located in Pulitzer Hall on Columbia’s Morningside Heights campus in New York City. Some reports have it that she started studying here in the year 2016. Christiana Barkley is of a mixed race. Her father is a Black American while her mother is Caucasian. Though it is a known fact that Charles Barkley’s daughter – Christiana Barkley was born into wealth and is still swimming in wealth, she seems to be determined to lead a normal life funded with her own earnings as much as it is possible. At a time, Christiana was reportedly working as a Sales Assistant at Turner Sports which is a broadcast sports company. Aside from this, she has worked in various other capacities en route to the zenith of her career. Going by the reports published by some reliable websites, her net worth is estimated to be about $1 million. Her father, on the other hand, is a multi-millionaire with a net worth estimate reported to be between $30 to $40 million. Beauty is not the only thing the journalist seemed to have gotten from her mother. Christiana has also shown that she has a heart of gold like her mother by identifying with charitable causes. In the year 2016, she was spotted with her mother Maureen at the Fresh Start Fashion Gala. The charity event had more than 730 guests in attendance who raised about $1.5 million for charity. You might recall the incident that happened on Twitter some time ago when some racy pictures of a purported Christiana Barkley hit the social media community on Twitter. The pictures were posted with the username Ari. It turned out that the woman in those pictures is not Maureen Blumhardt and Charles Barkley’s daughter, rather it was some other woman who goes by the name Villanova. Given the striking resemblance between both women, people were quick to believe and peddle the rumor that it was Barkley’s daughter. Considering her age, her social standing and of course the exposure her career as a journalist gives her if not already, people are agog to know the man in Christiana Barkley’s life. Our findings revealed that there has been no mention of a significant other in her life. None as a boyfriend/fiance neither is there any as her husband. Being of mixed race has got Christiana having the best features of both her father and mother. With regards to her height, she is a tall woman standing at a height of 5 feet 9 inches. Her body weight and other measurements like her bust, waist, and hips have not been publicly reported.